AUSTRALIA – MineExcellence provides an integrated cloud and mobile based technology platform for blasting that makes it readily accessible to an average blaster. This platform takes an integrated view of blasting. It enables an average blaster to not only design blasts but also analyze how the design performs and cater for adverse impacts commonly seen during blasting such as vibrations, fly rock etc. This platform is a significant innovation since it makes high quality drill and blasting Intelligence available in the hands of an average blaster, their supervisor and senior mine management accessible anywhere, anytime via a SaaS and mobile platform. The platform caters for blast lifecycle (blast design, blast data collection, analysis, predictors / optimizers (vibration, fragmentation, fly rock etc). A number of large Tier 1 miners (and small miners too) are using this platform centrally cross all of their mines. Multi-tenancy makes this platform extremely flexible and hence is being used by a number of large blasting contractors as well as they provide access to their clients as well. Software-as-a-Service (SaaS) means anyone can access it anytime from anywhere without the need for infrastructure (servers, computers). You can use the platform by paying on a month by month basis. 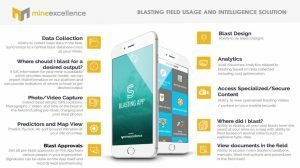 The Smart Blasting mobile app is integrated with the online platform and provides ability to capture detailed blast information and do analysis in the field including capturing GPS locations, date/time, photographs and video etc. Systematic storage, retrieval and analysis of blasting data to determine analyze blast performance. Industry has typically only concentrated on blast designs, but the analysis of how blasts are performing and appropriate actions have typically been missing. This platform enables blasting personnel to vary critical parameters such as dilution, vibration, fragmentation, fly rock and fines generation. It is expected that in due course this will result in significant productivity gains. It is also a move towards safer blasting to factor in vibration and fly rock prior to a blast. The platform is suited to blasting cost analysis, if required. It is possible to capture explosive and manpower and associated costs during blasting to report and analyze. The blasters management portal provides visibility to central mine management and blasting supervisors across all the mines in a large organization from the same central system. It enables assessment and comparison across all mines for important parameters (powder factor, costs, production, etc). The widespread successful adoption of SaaS and mobile based model for technology for blasting is a global first. The industry was in strong need for technology suitable and useable in an integrated manner for the blast lifecycle. MineExcellence has provided it. The blasting software technology space needed disruption and MineExcellence platform will be a significant aid to miners in improving overall mine to mill productivity.